Inventory We are a resale marketplace, not a box office or venue. Ticket prices may exceed face value. This site is not owned by Blossom Music Center . 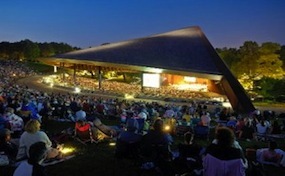 The Blossom Music Center opened in 1968 in Cuyahoga Falls, Ohio. The amphitheater was originally built as the home of the Cleveland Orchestra and now plays to the hottest touring performers in the Cleveland Metro area. The Blossom Music Center recently went through a major $17 million renovation that was completed before the 2003 season. The Blossom Music Center box office has the ability to accommodate 5,700 seated guests under the pavilion and another 13,500 on the lawn. Recently, the Blossom Center has played host to some marquee performers like Dave Matthews Band, Radiohead, Phish, Bon Jovi, Tom Petty, the Jonas Brothers, Aerosmith, Eric Clapton, and Kiss. Blossom Music Center tickets are in high demand during the summer concert-touring season. The Blossom Music Center is the summer home to the Cleveland Orchestra and Blossom Festival. The Carnival of Horrors has been hosted there every year since 2003, a must visit for all Halloween enthusiasts. The facility is surrounded by naturally wooded National Park property, giving it a unique atmosphere compared to other large venues. CenterCuyahogaFalls.com is not associated with any primary website, box office, or official supplier. We proudly offer online access to all events in the secondary market. Our inventory comes from a large network and the low prices for your online convenience. To purchase tickets to all Blossom Music Center events simply call our operators or follow the steps online through the checkout.